I stepped outside this morning to take a couple of pictures while the sun was shining. The sky is getting dark as I type this and it looks like a storm is brewing. I finished my applique memory quilt this weekend. The most fun was making these dragonflies and the bumble bees below. It is off to the quilter so Mary can make her magic. I'm going to save the rest of the quilt and show you when it's finished. This one is near and dear to my heart. My friend and boss, Nancy, was on vacation last week and went to the Brimfield Antique show with her husband. She kindly brought me this gift. 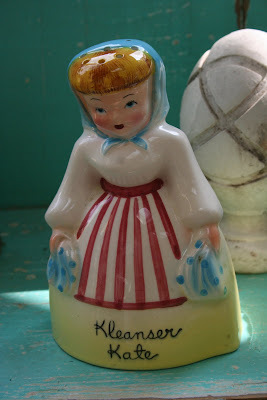 Kleanser Kate is made by Napco and has holes in her head and a stopper on the bottom for holding cleanser. Isn't she a beauty? Nancy bought one for herself too. I have not ever seen this piece. This little guy is the newest addition to my pixieware collection. He reminds me so much of my college age son when he was little that I believe this one is my favorite to date. I need to come up with a better way to display these and if any of you have suggestions, I'm all ears (or is that eyes?). This rose is simply stunning. I can see it from my kitchen window and it always takes my breath away. I got it last year at our local farmers market. It looks to be a climber but has only had two blooms this year. The color is as bright as this picture, I didn't touch it up at all. The sweet peas have started blooming. This dainty flower always makes me think of Peter Rabbit and Beatrix Potter. I'm trying to train it to climb up a ladder but it just grows everywhere it can. Even plants appear to have a mind of their own. Blessings! Can't wait to see the pretty quilt! Have never seen the Kleanser Kate before...so cute. Nice post. I love the quilt, at least what I could see of it. I'm looking forward to seeing the rest of it. What a beautiful peak at your handiwork. I can't wait to see the big reveal. Your flowers look gorgeous! I love the vintage look of your blog-it's pretty too! 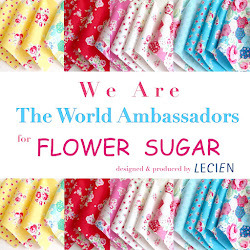 Hello again to you and your lovely blog! I took a hiatus to get married and moved but am happy to be rejoined to the world of blog. Your quilt is so adorable! I love the applique!